Millennial Employees words on a worker or staff member on an organizational chart to illustrate finding and hiring young people. Photo courtesy of Shutterstock. As an employer, you may be only concerned about hiring the best candidate for a job. 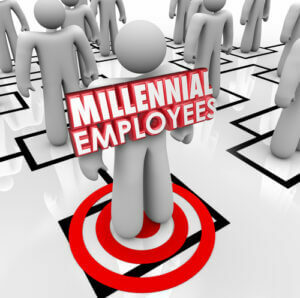 However, have you thought about what it takes to attract millennials to your company? While you might think they only want a nice salary, there are other factors that play a role in deciding where they want to work. Companies that don’t recognize those factors will risk losing out on these modern workers. So, if your goal is to recruit the millennial generation, you should consider what else is important to them. Willingness to compromise – In order to gain employment in a recovering economy, millennials have been willing to make sacrifices. The same study identified that 32% had taken smaller salaries than expected, 17% received less benefits, and 17% did not work in the location they wanted. When it comes to graduates, those in the United States have been among the most willing to make compromises. Employers need to understand, though, that just because millennials have made compromises to get jobs doesn’t mean that will last. A better job market will lead to more opportunities, which means some employees might move on in the future. Being rewarded – Don’t get me wrong; millennials do care about salary. However, if employers can offer more incentives, they will have a better chance of recruiting and retaining them. According to the study, the two most important benefits are training and development, and flexible working hours. Working for a reputable company – Millennials do not want to work for just any company but one with a good reputation. They want to know that their employer brand represents a positive image, and as employees their work means something. Going forward, employers might need to sell their brands more convincingly, as Gen Y has stated that there are some industries they are not interested in working for because of their negative perception. It is a mistake for employers to believe that millennials only value money when choosing a job. In order to make their companies more attractive to this group, they must think about other factors important to them. Otherwise, employers risk losing out on talent that can add value to their companies. In the next article, we will focus on developing millennials.